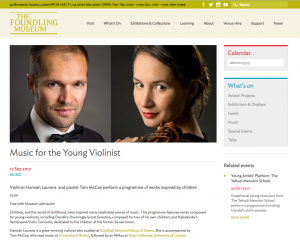 "After hearing their debut concert in Eynsham (delicate performances of Mozart and Schubert sonatas) I immediately asked Hannah and Tom to come and play for our Music at The Limes recital series in Standlake. Their thoughtful programming for Mothers' Day enchanted the full-house audience. Watch this duo as they are attracting an enthusiastic following."